Catlin’s Arctic Diary: Who’s Writing It? Remarkably, the “diary” messages arriving from the Catlin Arctic Survey Team resemble each other, with a single-phrase beginning sentence, a similar length of around 300/330 words, lexical density around 55%, etc etc. With the experience in one’s blog that entries can be vastly different from one day to the next for the same person when there is no professional oversight to the text, one is left wondering how heavy an editing is being done on the BBC side before the original thoughts by Hadow, Daniels and Hartley are published to the world. Is that some kind of high-brow “reality show” that we are being fed with? Some people are a bit reluctant in making it clear that the AGW efforts are a political attempt at social engineering on a massive scale, perhaps with one idea or two about a World Government. That’s definitely not the case for Professor Claus Leggewie, Director of the Institute for Scientific Culture for the State of Essen (Germany), and Member of the Scientific Advisory Group for the German Federal Government on all topics Global Environmental Change. Is Humanity Abysmally Clueless On Climate? Leaders of the German-Indian expedition said they had gained valuable scientific information, but that their results suggested iron fertilisation could not have a major impact, at least in that region of the oceans. A little-known exhibition is undergoing in Kaufbeuren, Bavaria (Germany) until June 14, 2009: “Promenade Among The Degrees – Artists react to Climate Change“. There is unfortunately not much available on the web. Plenty of photographs on show, apparently, although it is not clear how any of those would represent Climate Change or any consequence of it. More interesting the “Calling the glacier” exhibit, with a phone-like device where one can hear a melting glacier. Unfortunately Kaufbeuren is not exactly a place one by pure chance can pass by. Perhaps somebody somewhere will publish a few pictures of the exhibition itself. The next time a warmist yells Venus. Just yell back Mars. Its’ atmosphere is 95% carbon dioxide and yet, oops – it’s not 400 degrees, instead, it’s minus 40. The warmists with half a brain might come back at you with the explanation that Mars’s atmosphere is thin, but that’s just fine. That IS the point really isn’t it? Mars is cold because it’s atmosphere is so thin, and for exactly the opposite reason, that’s why Venus is Hot. ps Hugs&kisses for linking to Omniclimate, of course! A list of my Venus-related blogs is available at this link. Is Climate Change such a high priority for President Obama as he sometimes claims it to be, and for what reasons exactly? Apparently, US Secretary of Energy Steven Chu is convinced that “a shift away from fossil fuels is essential to combat global warming“. So for Chu the course of action is to change on Energy in order to deal with Global Warming. In other words _the_ problem is Global Warming, and Energy just a means to solve it. In truth, though, Chu is (still?) not the person taking “the key decisions on energy and climate change policy“. That is in the hands of a restricted group headed by the “politically savvy” Carol Browner, an Al Gore’s “acolyte” and President Obama’s Climate Czar. Browner believes that climate change is “the greatest challenge ever faced“, so we are back to Chu’s stance. However, there are still all indications that the President himself takes a different approach, considering Climate Change as just one part of the wider issue of Energy, and not viceversa. For Obama himself, in other words, _the_ problem is how to get a safeguarded and stable supply of Energy, and Climate Change just a politically useful, additional reason to push for it. Because we know that enhancing America’s competitiveness will also require reducing our dependence on foreign oil and building a clean energy economy, this budget will spark the transformation we need to create green jobs and launch renewable energy companies right here in California. It makes clean energy the profitable kind of energy. It invests in technologies like wind power and solar power and fuel-efficient cars and trucks powered by batteries like the ones I’ll be seeing in Rosemead tomorrow, all of which will also help combat climate change — because the weather is already nice in Orange County, we don’t want it to get warmer. Well, I say our challenges are too large to ignore. The cost of health care is too high to ignore. The dependence on oil is too dangerous to ignore. Our education deficit is too wide to ignore. What will Czarine Browner think of the above? 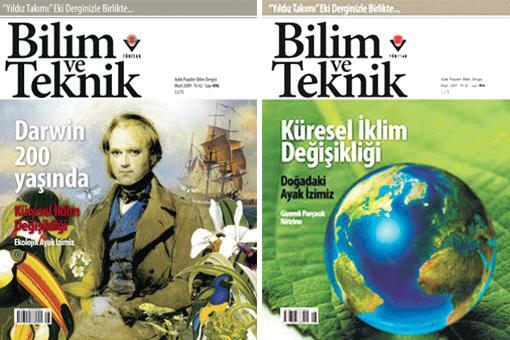 Either an episode of censorship, or the reaction to an overeager editor trying to change a magazine’s content at the very last moment, but in any case what should one make of the fact that in Turkey as in many other places in the world, it is easier to talk Climate Change than Darwin? Whose side is Science’s, one wonders?